Asserting that Dhruv helicopters are good, Defence Minister Manohar Parrikar on Saturday said the Hindustan Aeronautics Limited has been asked to set up additional depots for spares after Ecuador put the Indian choppers on "restricted" operations following a spate of accidents. "Dhruv is a good platform. If there is any issue about maintenance... I have already discussed. I have asked HAL to create a depot wherever it is required so that spares are available," he told media persons. He was asked about the move by Equador to put the remaining three helicopters it had bought on restricted operations and if it would affect India's plans to emerge globally as a defence manufacturer. "This is a problem of getting spares in time. HAL has taken a decision to keep Rs 400 crore aside for built up of spares. It might take 3-6 months," he said. 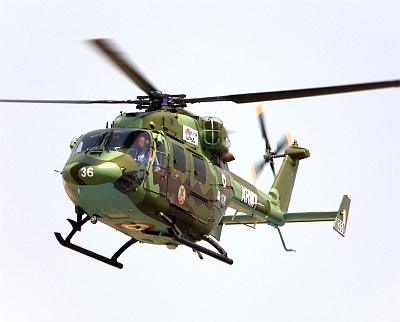 Ecuadorian Air Force had bought seven Dhruv helicopters from state-run HAL in 2009 under a deal estimated to cost about $45 million. Two of them had crashed earlier while two suffered accidents recently, in a span of about a fortnight. "Three aircraft have had their operations restricted because they are undergoing a complete check," Security Minister Cesar Navas was quoted as saying by El Universo newspaper after the accident on January 27.
after taking off at a military base in Tena, according to local media. Two people were injured in the mishap. It was the fourth Dhruv to suffer an accident since 2009. Incidentally, this mishap occurred at a time when an Indian team was already there to probe the incident that took place on January 13. Official sources said another General Manager (Repairs and Maintenance), has now being sent to the northwestern South American country following the second accident. They said the joint probe team will look into all angles, including technical and human error. A major accident happened in February 2014 when a Dhruv, assigned to the air force and sometimes used to transport President Rafael Correa, crashed on a flight from Guayaquil to Quito, killing three of its four crew members. Earlier in October 2009, one helicopter crashed while making a low pass during a military ceremony in Quito, injuring the pilot and co-pilot. Dhruv helicopters were inducted into the Indian military in 2002. What gifts will Obama bring to India?